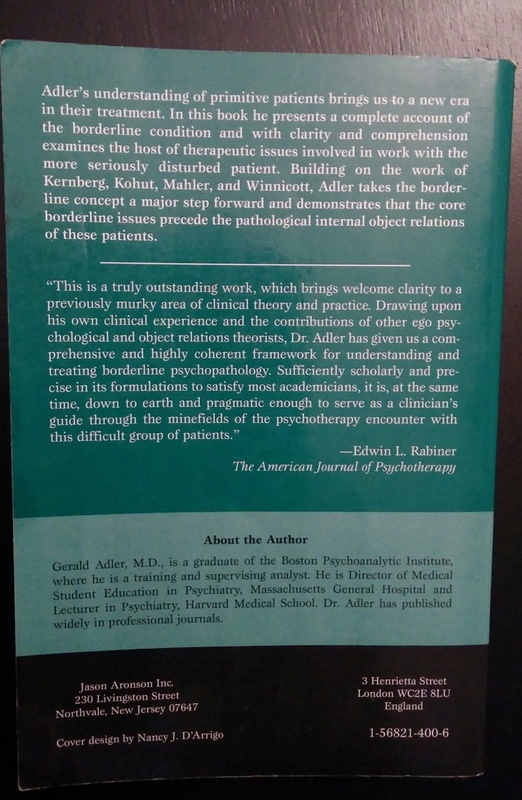 Several years ago, when I feared that full recovery from BPD was impossible, my therapist recommended me to read Gerald Adler’s book Borderline Psychopathology and Its Treatment. Now in his mid-80’s, Adler had earned a reputation as one of the best psychodynamic theorists writing about Borderline Personality Disorder. 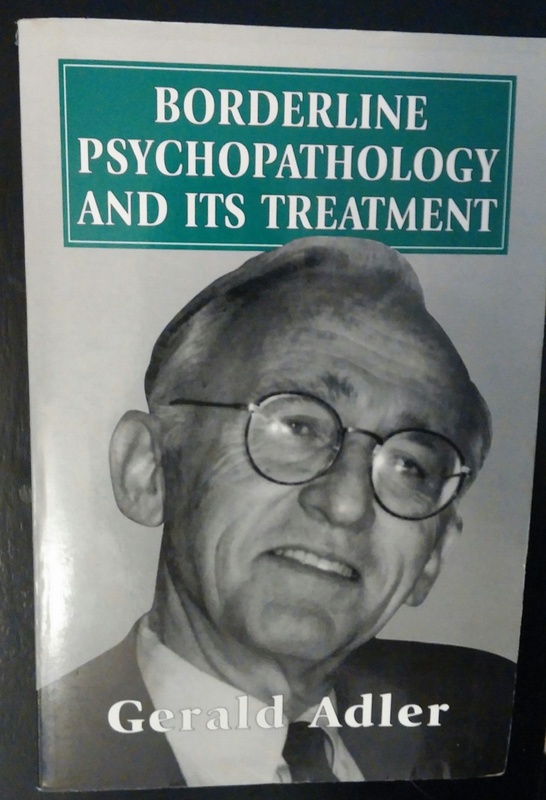 In the early 1990s, Adler visited the Washington School of Psychiatry to give a talk which my old therapist attended. What impressed my therapist most was not Adler’s knowledge or clinical skill, but his compassion and goodwill. Out of all the speakers she remembers, only Adler stayed two extra hours to answer questions from junior therapists. I have met Adler in Boston and spoken to him via phone and Skype five other times. He engaged my fears about BPD compassionately yet forcefully. He had a wonderful quality of being active in directly addressing what was bothering you, but in a manner that felt supportive not intrusive. He reached me even though I was regressed and depressed at the time. In this article, I’ll discuss some of the key theoretical views of Gerald Adler on Borderline Personality Disorder. Get ready to learn from a master! First, I would like to quote some of Adler’s views on the importance of borderlines’ lack of positive relational experience. “In the ambivalence theory account of borderline functioning, introjective insufficiency results from an inability to tolerate ambivalence toward the whole object. But my own clinical experience suggests the utility of a different theoretical approach. If the primary issue for borderline patients were the need to keep apart introjects of contrasting affective coloration, then there must already have been substantial solid development of positive introjects around which the self is organized. While ambivalence toward the whole object may then lead to a lack of self-cohesiveness, it would not issue in the felt threat of annihilation. This might seem confusing. 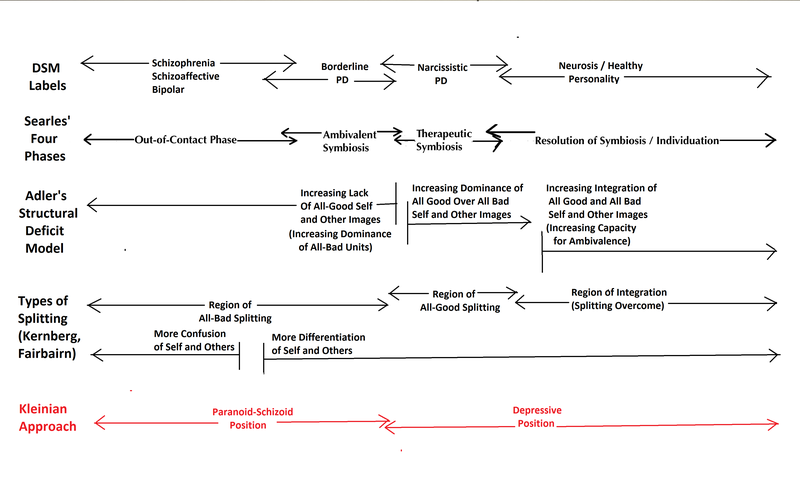 Very simply, Adler is saying that the primary problem for borderlines is not their all-good all-bad splitting – which is a symptom – but rather their lack of sufficient positive introjects, which is the underlying cause of their psychopathology. By “introject”, Adler refers to an internalized mental representation of another person and the way they make us feel. “Positive introjects” are comforting, supportive representations of other people, for example those of caring parents. A healthy child develops solid, reliable positive introjects to soothe itself based on mostly good experiences with its parents. Such a child can use “evocative memory” to comfort itself by remembering how good relationships feel even when the external person is not physically present. “Introjective insufficiency” means a lack of sufficient positive introjects to comfort oneself. It is this introjective insufficiency that results in the feelings of emptiness, panic, and fear that borderlines often experience. In stressful situations, the lack of positive introjects leads borderlines to feel that their very psychological being is under threat. That is what Adler means when he discusses “annihilation panic”. In a healthier person, stress would be challenging – i.e. it would affect their “self-cohesiveness” and make them feel “not like themselves” – but it would not make them feel that their psychological being was threatened. However, with borderline individuals who have had little positive nurturance growing up, and whose positive introjects and self-comforting are therefore tenuous, emotional stress leads to the feeling that they may be destroyed psychologically. In Adler’s view, the strength and frequency of this phenomenon supports the idea that a lack of positive introjects is primary for borderlines, and that inability to tolerate ambivalence is secondarily based on this deficit. As humans we need positive relationships, and positive introjects derived from them, for our psychological survival and well-being. Positive introjects serve the mind the same way oxygen serves the body. When they are weak, we feel existentially threatened, like a mountain climber running short of oxygen. 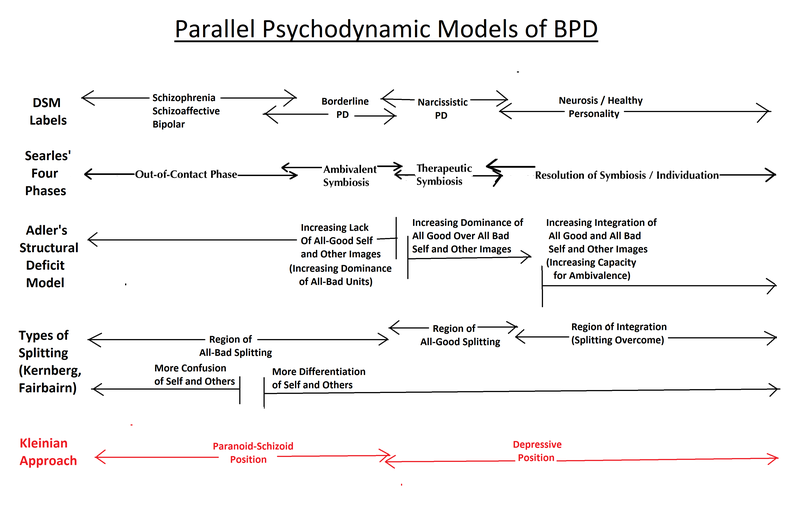 Adler’ view of BPD is a “deficit” model – he focuses on what is missing in a person’s psychological development, and on what is needed to remedy the deficit. Other therapists focus more on “conflict”, i.e. what conflicts associated with “bad” relationships block the borderline’s psychological development. These approaches are complementary and could be considered sides of the same coin. “The fundamental psychopathology of the borderline personality is in the nature of developmental failure: Adult borderline patients have not achieved solid evocative memory in the area of object relations and are prone to regress in this area to recognition memory or earlier stages when faced with certain stresses. The result is relative failure to develop internal resources for holding-soothing security adequate to meet the needs of adult life. Adler’s point is that parental support is usually lacking in the histories of children who become borderline, and that lack of support leaves them unable to comfort themselves as adults. According to Adler, future borderline children are psychologically capable of developing self-soothing capacity, but they experience too much neglect and/or abuse to allow for it. Adler noted that in virtually every case of BPD he treated (comprising dozens of borderline patients over a 40-50 year career), the borderline patient reported significant neglect or abuse in their childhood. In an earlier article, I described Searles and Seinfeld’s four phases of treatment for BPD. Adler has a related model comprising three phrases. Here I’ll quote the way Adler describes these phases at length. I have slightly paraphrased some areas to make them more accessible, while keeping the meaning intact. “The primary aim of treatment in the first phase is to establish and maintain a dyadic therapeutic relationship in which the therapist can be steadily used over time by the patient as a holding selfobject. This situation makes it possible for the patient to develop insight into the nature and basis of his aloneness, and to acquire a solid evocative memory of the therapist as sustainable holder, which in turn serves as a substrate out of which can be formed adequate holding introjects. That is, developmental processes that were at one time arrested are now set in motion to correct the original failure. 1) Holding is never enough to meet the felt need to assuage aloneness, which enrages the patient. The patient expects to lose the therapist through the therapist’s responding to his rage by turning from “good” to “bad”. 2) The holding selfobject that does not meet the need is not only the target for direct rage but is also distorted by means of projection of hostile introjects… The inevitable result of this projection is the loss of the good holding object. 3) The object that is so endowed with holding sustenance is deeply envied by the needy borderline patient. This envy necessarily involves hateful destructive impulses. Any of these sources of rage can lead to transient loss of holding introjects. At such times the patient is subject to the terrifying feeling that the therapist has ceased to exist. There is yet one more impediment to the use of the therapist as a holding selfobject. It is a primitive, guilt-related experience that involves the belief by the patient that he is undeserving of the therapist’s help because of his evilness. In extreme situations this guilt can lead to suicide attempts. Acquiring insight into and working through these challenges are necessary in order for the borderline patient to develop a stable evocative memory for the therapist as holding sustainer. Each of these impediments must be worked through in the standard ways as it manifests in transference, through use of the therapeutic maneuvers of clarification, confrontation, and interpretation. The amount of support required may considerably exceed that involved in most psychotherapies. 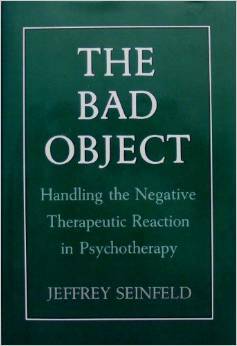 The outcome of the work is this: The patient learns that the therapist is an enduring and reliable holding selfobject, that the therapist is indestructible as a “good object”, that holding closeness poses no dangers, and that the patient himself is not evil. Hope is aroused that the relationship and the therapeutic work, involving understanding of object and selfobject transferences plus genetic reconstructions, will open the way for psychological development and relief. The healing of longstanding splitting of the type Kernberg describes must await the formation of stable holding introjects. Efforts to bring together the positive and negative sides of the split can be therapeutic only after development of more stable holding introjects along with correction of distorting projections that have acted to intensify the negative side of the split. Some of the technical terminology might be confusing. By “holding” Adler means the comforting psychological aspect of a relationship, not literal physical holding. “Holding” is a primary psychological element of any deep friendship, love relationship, or therapeutic alliance. The “selfobject” is a term referring to the way the therapist is experienced as a comforting person or “good parent” by the patient. It describes how the patient experiences the therapist as serving their emotional needs, without fully realizing that the therapist is a separate person psychologically. That is why there is no space between “self” and “object” as written. It was invented by Heinz Kohut who wrote about its value to narcissistic patients. Adler’s main points are that the borderline needs a new, positive relationship to grow psychologically, and that emotional resistances to forming that relationship must be confronted and removed. Borderline individuals reading this can probably agree that rage, fear, and guilt create obstacles to forming a positive relationship in therapy. In the book, Adler details how the resistances to forming a positive new relationship to the therapist – i.e. rage about the imperfections of the therapist, envy of the therapist, fear of closeness, guilt – must be directly interpreted and confronted to allow the patient to internalize the therapist as a positive new object. This is a lengthy, gradual process taking many months and sometimes years. Adler’s last paragraph is important – about how splitting cannot be resolved until a stronger positive relationship between patient and therapist exists (with correspondingly stronger positive introjects in the patient). In my early attempts at recovery, I worked on seeing things in a less black and white way. I had little to no success. I eventually gave up and focused on building a positive relationship to my therapist, and also to my family and new friends. Eventually, the process of resolving splitting happened naturally a few years later, once more positive relationships were in place. My experience confirmed Adler’s view that correction of splitting must await the development of more stable positive relationships/introjects. Adler also notes the importance of correcting “distorting projections that have acted to intensify the negative side of the split”. I learned much from this insight. What it means is that overly negative, distorted beliefs about the external world serve to prevent borderlines from seeing themselves and others ambivalently. It is necessary to “extract” these negative beliefs and correct them into views that are more realistic and balanced. This sets the stage for ambivalence rather than splitting. 1) That everyone thought I was ugly. 2) That women would not want to date me if they knew of my sexual inexperience. 3) That most therapists agreed that BPD was untreatable. 4) That therapists couldn’t be trusted and only cared about money. I thought and acted as if people actually believed these things. It was necessary to correct these beliefs in order to view other people and myself realistically. I liken the process of confronting such “distorted projections” to that of cleaning an infected wound. As long as the pus remains inside the wound, it festers, hurts, and may get worse. Draining the infected area is painful, but ultimately brings relief and allows for healing. Likewise, confronting painful, guilt-laden beliefs is uncomfortable, but ultimately freeing, promoting the development of a more realistic view of the world. “In general the holding introjects established in phase I are considerably unrealistic; they are idealized in a childlike fashion. Were treatment to stop here, the situation would be quite unstable, for two reasons. First, the unrealistic idealization of the holding introjects (based on the therapist), along with the projections of them onto persons (in the patient’s external life) who serve as holding selfobjects, would eventually be confronted by reality and would inevitably break down. Second, at this point the patient is still heavily dependent on a continuing relationship with holding self-objects (including the therapist), as well as holding introjects, for an ongoing sense of security; this is not a viable setup for adult life, in which selfobjects cannot realistically be consistently available, and must over the years be lost in considerable number. 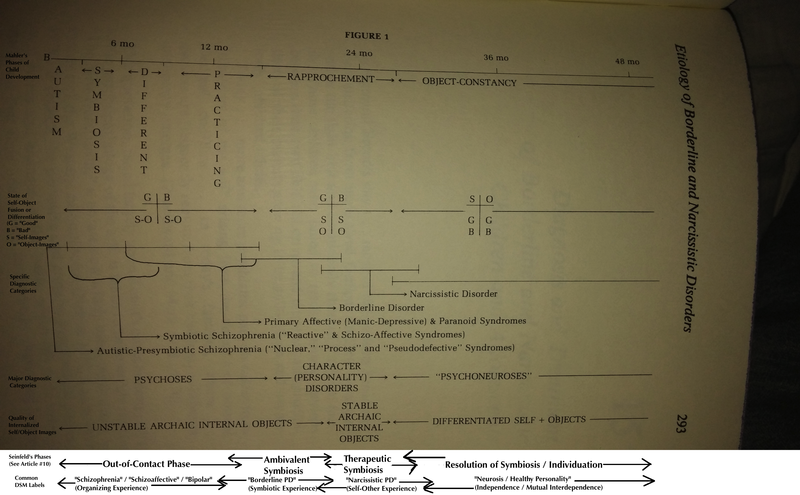 The therapeutic work in phase II parallels that described by Kohut in treating narcissistic personalities. Kohut describes the therapeutic process as “optimal disillusionment”. No direct interventions are required. The realities of the therapist’s interactions with the patient and the basic reality orientation of the patient always lead to the patient’s noticing discrepancies between the idealizing holding introject, based on the therapist and reflected in the transference, and the actual holding qualities of the therapist. Each episode of awareness of discrepancy occasions disappointment, sadness, and anger. If each episode of disappointment is not too great, that is, is optimal, a series of episodes will ensue in which insight is developed and unrealistic idealization is worked through and relinquished. (Any disappointments that are greater than optimal precipitate recurrence of aloneness and rage in a transient regression that resembles phase I). Here, Adler describes the progression that can occur after a stable, trusting relationship has been achieved in therapy. His main point is that, due to their childlike needs for dependence and support, borderlines tend to unrealistically idealize the therapist and view him as perfect during phase I, and that this idealization must eventually be made more more realistic in phase II. The introjects (mental representations) of the therapist that borderlines develop to comfort themselves are correspondingly unrealistic, and prone to breakdown under stress when others do not treat them perfectly. To deal with this issue, Adler describes how the patient must gradually realize that the therapist is not a perfect parent, but is an actual therapist who is nevertheless sincerely interested in the patient. If the patient can come to see the therapist more realistically, as both good and bad, this carries over to relationships in the outside world. This intrapsychic progress helps the patient to be less sensitive to failures in empathy from other people, who will inevitably disappoint the patient from time to time. This process should occur gradually, so that the patient is not confronted too suddenly with the reality that his earlier idealizations were unrealistic. In my view, the harder work, and in a way the more fundamental work, is what Adler describes in phase I. It is the work of Phase I – building a positive, trusting relationship and fully relaizing that one is not a bad person – that makes one no longer borderline. The work of phase II is also important, albeit easier. It is like building a base camp on a safe island (phase II) that one has reached after being shipwrecked and having to swim to shore in a stormy ocean (phase I). Adler’s phase II can be compared to the later part of Seinfeld’s phase 3 and the early part of his phase 4. “To become optimally autonomous – that is, self-sufficient – in regard to secure holding and a sense of worth requires two developments: (1) A superego must be established that is not inappropriately harsh and that readily serves as a source of a realistically deserved sense of worth. 2) The ego must develop the capacity for pleasurable confidence in the self and for directing love toward itself that is of an affectionate nature. This development of the capacity to love the self contributes not only to enjoyment of being one’s self but also makes possible a reaction of genuine sadness in the face of losses that involve the self – accident, disease, aging, approaching death. The therapeutic endeavors in phase III are based on the principle that capacities to know, esteem, and love oneself can be developed only when there is adequate experience of being known, esteemed, and loved by significant others. Often, (formerly borderline) patients require help to gain the capacity to experience subjectively the factualness (validity) of their esteemable qualities, as well as the capacity to experience feelings of self-esteem. In this phase of treatment, the ego evolves as its own resource for pride and holding through development of intrasystemic resources that are experienced as one part providing to another, both parts being felt as the self. These ego functions are developed through identifications with the homologous functioning of the therapist as a selfobject. That is, the therapist, verbally at times, but largely nonverbally, actually does provide the patient with a holding function, a function of loving in the affectionate mode of object love, a function of validating the patient’s competencies, and a function of enjoying the exercise and fruits of the patient’s competencies. Total self-sufficiency is, of course, impossible. For its healthy functioning, the ego requires interaction with the other agencies of the mind as well as with the external world, and no one totally relinquishes use of others as selfobject resources for holding and self-worth, nor does anyone relinquish using selected parts of the environment (art, music, and so forth) as transitional objects. These dependencies are the guarantees of much of the ongoing richness of life. In this passage, Adler’s compassion and positive outlook on human nature can be observed. Psychodynamic therapy is often criticized for over-focusing on what is wrong or pathological. Adler stands out in that he emphasizes what needs to go right in healthy emotional development. In this phase, Adler describes how former borderlines can learn to love themselves affectionately and enjoy being themselves. He explains how crucial it is to feel loved and appreciated by others before a person can reciprocally do that for themselves. This phase could be compared to the later part of phase IV (Resolution of the Symbiosis) in Seinfeld’s phases. To me, what Adler says here is self-explanatory and obvious. However, I expect that many people will be surprised to read such positive language about BPD. The public remains largely unaware that borderlines can become fully non-borderline, living normal lives in which they enjoy themselves. You don’t find this in the DSM! During my contacts with Adler, I had a chance to ask him if he considered Borderline Personality Disorder a valid diagnosis. He answered that his main concern was helping people get better, and that he thought very little about diagnosis. He said that giving someone a diagnosis doesn’t tell you much about them, and that understanding their individual history and current problems is much more useful. I pressed him to say something more about the BPD diagnosis. Adler said that he thinks it is useful for insurance reimbursement purposes, but not much else. 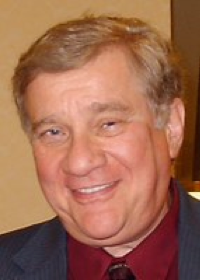 Adler added that he sometimes wishes that the word “borderline” had never existed. He agreed with me that diagnoses like BPD have not been scientifically proven to be valid, but said it doesn’t really matter. Adler added that he doesn’t view BPD as a fixed diagnosis, but rather as a subjective area along a continuum or spectrum of personality / emotional development. He defines BPD via the patient’s ego development – for example, by the relative presence or lack of self-soothing capacity, and by the degree of splitting – not by the other symptoms in the DSM. Adler joked that the DSM gets updated every few years to torture people like him who have to learn new diagnostic codes for insurance reimbursement. On one of our phonecalls, I asked Adler if he thought BPD is cureable. He answered that “cure” is not the right word for BPD, since it implies the removal of a medical or physical condition, and connotes an idealized state where no problems remain. But Adler did tell me that the majority of the borderlines he treated improved dramatically, and that many are no longer remotely borderline. He said he has worked with many former borderlines who have “largely worked it out and live good lives.” He emphasized that he was still very optimistic about borderlines doing well in long-term intensive therapy. Adler added that people in general are not “cured” in therapy. Rather, he said that no person becomes perfectly well or free from life’s challenges, but they can become better enough to live well. There is much more in Adler’s book that cannot be discussed in the space here. For those interested, Adler’s book discusses the therapeutic alliance, how to handle borderline acting out, BPD’s relation to narcissistic personality and schizophrenia, the positive aspects of regression, hospital management, etc. Two points will suffice to conclude this entry. The first is to reemphasize the importance of educating oneself about Borderline Personality Disorder. Understanding BPD psychodynamically gave me an advantage in planning my recovery and in understanding myself. Borderline Psychopathology and Its Treatment was among the first of dozens of books I’ve read about BPD. Despite its age, its formulations are relevant to borderlines and their therapy today. Adler’s viewpoint on deficits in self-soothing capacity and positive introjects are not the only way I conceptualize BPD, but they are important. The second is to remain skeptical. I do not agree 100% with Adler’s views. For example, I think he focused insufficiently on conflict (versus deficit) and on how internal bad objects operate in the mind of a borderline to actively block new positive relationships. Jeffrey Seinfeld and others write better on this topic. However, I get more than enough out of his work to like it and find it useful. That is the way to handle writings about BPD – take what is useful from them, and leave the rest. I hope you, the reader, don’t blindly accept everything I say either. Although I know that BPD can be recovered from, I am not perfectly informed about nor do I have all the answers for BPD. Therefore, I encourage people to read widely about BPD online and offline, and to accept what feels right to them. Nevertheless, I hope people will benefit from reading some of Gerald Adler’s views on the condition. He is a great person, and I will miss him when he’s gone. This entry was posted in Uncategorized and tagged borderline personality disorder, BPD, bpd causes, bpd cure, BPd demystified, BPD help, bpd stories, bpd therapy, bpd treatment, Gerald Adler, hope for borderline personality disorder, mental health, psychoanalysis, psychotherapy, recovery, trauma, understanding BPD on April 30, 2014 by bpdtransformation.